Yes I have a new banner -- I've had so much trouble getting it right and I think it's still a bit off but I can't go on fiddling for ever. Not sure even why I needed it as I really liked the old one, but perhaps it's spring in the air that makes me think of new beginnings. And while I'm at it I must apologise for not posting any reviews for a while -- I have been all over the place, back and forth to the UK from France, going to funerals, trying to keep up with the demands of my life. I haven't even done all that much reading in the past couple of weeks but I will be back, I promise. One problem is that the book I'm reading at the moment, which I bought on impulse on Brittany Ferries, is more than 500 pages long and I'm finding it so entertaining and informative that I can't give it up till I get to the end. I'm also reading Muriel Spark, which I shouldn't be as Muriel Spark Week is still almost a month away. But I'm deep in The Prime of Miss Jean Brodie (reading it on my iphone) and am absolutely swept away by what a wonderful novel it is. So you will be hearing more about these before too long. Now I have to read Elizabeth Taylor's A View of the Harbour because I'd forgotten about this. It's been Jane Austen all the way this week -- Emma with the 3rd years on Monday, Sense and Sensibility with the 2nd years yesterday. Different context, different group, but another lively discussion. This 2nd year group have been working their way forward chronologically since the beginning of the academic year -- last semester it was the 18th century, this semester it's the Romantic period, roughly 1789-1836. They've been doing mostly poetry and fiction, with a little drama and non-fiction thrown in. So they've read a few 18th century novels -- Robinson Crusoe, Fielding's Joseph Andrews and Fanny Burney's Evelina, to be exact. They struggled a bit with all of them -- the language and style seemed to them very archaic. Everyone agreed yesterday that Austen was so much easier to read, and seemed so modern in comparison. Interesting, and obviously true, even though S&S was probably written in the mid-1790s and so more or less contemporary with Fanny Burney's novel. It was the first novel Austen published, though it didn't appear till 1811. It was interesting to hear everyone's responses to the two sisters in the novel. Nobody was all that keen on Elinor, who they thought was too cold and repressed. 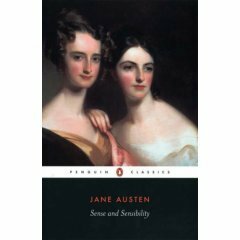 And indeed, though Austen does make it clear that Elinor has strong feelings -- she is privately in agony when Lucy Steele tells her that she is secretly engaged to Edward Ferrars, who Elinor is in love with and has supposed, or hoped, loves her in return -- she never shows them. My students thought that anyone who could keep their suffering so firmly under wraps probably wasn't suffering all that much anyway. I was quite surprised, though, to find that many of them did not really like Marianne all that much either! I have always been very fond of Marianne -- I know she has to learn to be a bit more self controlled, but she is so warm and sweet and responsive to the world around her. But quite a few of my students seemed rather shocked by her public displays of emotion. I must admit that though I have trouble deciding what is my favourite Austen novel, I know for sure that it isn't this one. Though it has many great things in it, it doesn't quite work for me for some reason. I'm teaching a 'Special Author' module this semester on Jane Austen. It's coming to an end now, and yesterday we were looking at Emma. It was an unusually lively seminar, everyone very engaged with the discussion. There was some division of opinion about Emma herself, and several students said they had never really warmed to her. 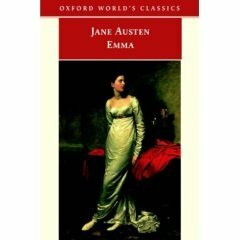 This is not really a surprise -- Austen herself said, when she was starting the book, "I am going to take a heroine whom no one but myself will much like". People find her snobbish, for one thing -- and, by today's standards, perhaps she is. But the main sources of disquiet seemed to be the way she manipulates Harriet into refusing Robert Martin's proposal, and above all her rudeness to Miss Bates at the Box Hill picnic. Of course these are here so she can learn from them, and certainly she does appear to do so. But a few students doubted if she would ever really stop being nosy and high-handed, and also wondered if she really was in love with Mr Knightly or just making sure she kept her high status in Highbury. This last bit is actually what some critics have said about the book. Other things they have said include the suggestion that Emma's interest in Harriet Smith has a lesbian element, and that Mr Woodhouse is suffering from syphilis. Yes, these are genuine arguments by respected academic critics. As the module includes an important element of reading recent critical approaches to Austen, we have to give them all due consideration. I have my own views, of course, which in the end are pretty traditional, but I do enjoy the to-ing and fro-ing which they elicit from the students. I don't really mind what kind of outrageous-seeming suggestions anyone -- student or critic -- makes about any novel, poem or play, but I do require them to be able to support their arguments by intelligent close reference to the actual text. In fact the bit about Mr Woodhouse is, for me, the most convincing, believe it or not! It's based partly on his symptoms and partly on the poem he keeps quoting, "Kitty, a Fair but Frozen Maid" which, as someone has pointed out, is actually a rather rude poem about a prostitute, which suggests that Mr W had a rather racy past before he became such a confirmed invalid. Next week we go on to Persuasion, not such a contentious novel, but one that I really love -- possibly, right now, my favourite JA, but that's probably because it's the last one I have (re-) read.